The Seahawks on Monday placed linebacker Mike Morgan on Injured Reserve and signed Jordan Tripp to take his place on the 53-man active roster. Though the Seahawks came out of Sunday’s 27-17 win over the New York Jets without any new ailments, the team on Monday placed linebacker Mike Morgan on injured reserve so he can deal with a nagging sports hernia. Coach Pete Carroll said Morgan, who is the starting strong-side linebacker and a key member of special teams, will have surgery Tuesday in Philadelphia and likely will miss 4-6 weeks. Being placed on IR, though, means Morgan must sit out at least eight weeks before he can return to game action. Teams can recall one player each season from IR, and Morgan so far is the only candidate to be brought back — Carroll said it is a possibility Morgan will return. He can return to practice after six weeks. Carroll said the procedure Morgan will undergo is similar to one that running back Marshawn Lynch had last season, also performed by Dr. William C. Meyers. Morgan made a visit to Philadelphia during the pre-season to have the injury examined. He was limited in practice last week after the injury flared up but was able to play nine snaps against the Jets. To take Morgan’s place on the 53-man roster, the Seahawks signed linebacker Jordan Tripp from the practice squad. Tripp, who played at Montana, played in 12 games with Jacksonville last season and 13 with Miami in 2014. Tripp was a fifth-round draft pick by Miami in 2014. Carroll said Kevin Pierre-Louis and Cassius Marsh could also help fill Morgan’s linebacker snaps. 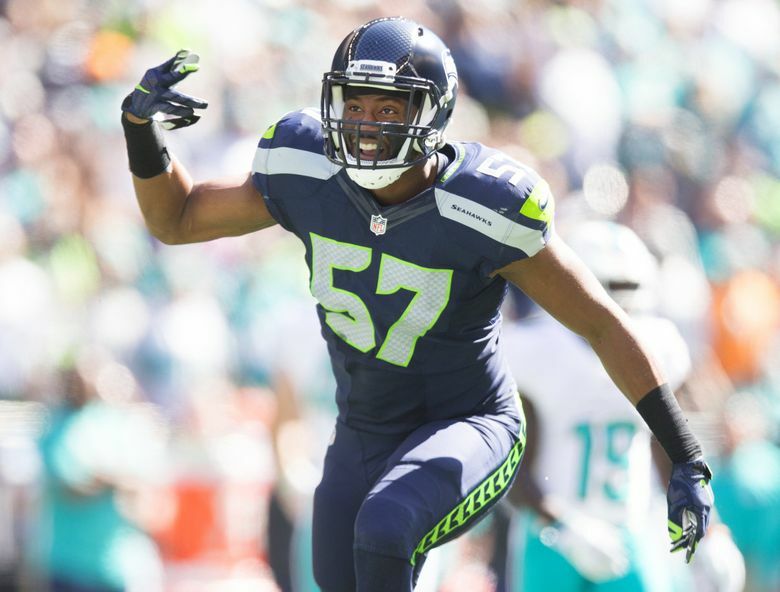 The strong-side linebacker role has become something of a complementary position in Seattle’s defense, as Morgan has typically come off the field when Seattle is in the nickel formation, which it has played almost 69 percent of the time this season. Morgan has played 64 snaps this season and another 45 on special teams. The Seahawks also released quarterback Jake Heaps off the practice squad and waived offensive lineman Terry Poole off injured reserve. Heaps had been signed to the practice squad to give Seattle another quarterback after Russell Wilson suffered an ankle injury against Miami in the season opener. Poole, a fourth-round pick of Seattle in 2015, has not played in a game for the Seahawks. Carroll also said defensive tackle Quinton Jefferson is having surgery to repair a broken bone in his hand and will miss two or three weeks. Jefferson has been playing with the injury throughout the season. Carroll also said running back Thomas Rawls will be out another 2-4 weeks because of a hairline fracture in a fibula. Rawls suffered the injury against the Rams on Sept. 18, and Carroll said it typically takes 4-6 weeks to recover. Carroll also said rookie defensive tackle Jarran Reed, who sat out the Jets’ game because of a hip injury, should return to practice next week. And Carroll also said running back C.J. Prosise, who has missed the past three games after suffering a broken bone in his wrist, may be able to play without a cast against Atlanta on Oct. 16. The Seahawks are off this week before returning to practice next Monday.